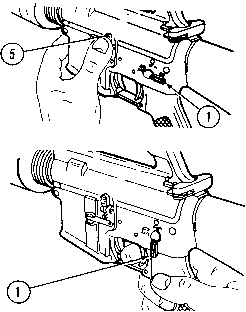 Ensure that selector lever (1) is on SAFE. 4. Check receiver and chamber (6) to ensure these areas contain no ammunition. 5. With selector lever (1) pointing toward SAFE, allow bolt to go forward by pressing upper portion of bolt catch (5). If weapon is to be stored, it should be dry fired to release tension on hammer spring. 6. Place selector lever (1) on FIRE and squeeze trigger to release tension on hammer spring.